Free Charts — Tommy Walker Ministries – "Declaring the Gospel through Worship"
Part of the vision of Tommy Walker Ministries is to make our music as free and accessible as possible. All charts below can be downloaded and enjoyed for free. Help us continue to declare the Gospel through worship; consider becoming a partner. Starting in February 7th we will release a song every week. Our motto for this Song of the Week series is, “Share a song, Share your faith!” So, we want you to partner with us in sharing these songs to anyone you know who may need the message of Jesus Christ. "The Book of John in Song" is a Bible reading plan with a song for each chapter, an album and a live worship evangelism event. We are so honored to partner with YouVersion and Salem Media Group to make this musical Bible reading plan free and accessible to the world. A new series of single song videos shot during our House Worship concert nights. These are brand new Tommy Walker songs recorded live in an intimate setting with friends and family. "Tommy's Throwback Thursday" is a new series that consists of Tommy acoustically performing selections from his 30 year catalog. "Song Of The Week" is a video series recorded during 2016 that features songs as: "Jesus Be Near To Me", "Speak The Word" and "Greater Than Great"
"Generation Hymns 2" is an ambitious project of bringing together people of various generations around the classic hymns of the church. 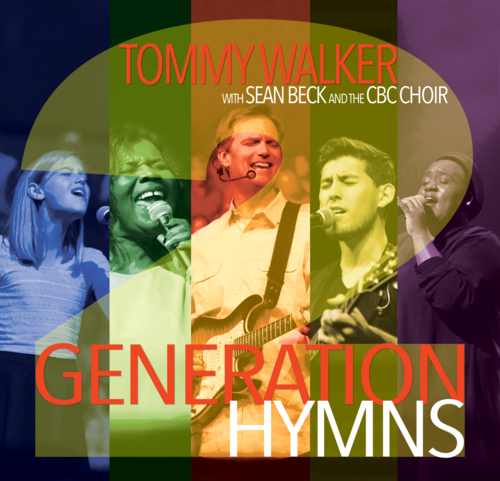 This album features songs as: "It Is Well", "Blessed Assurance" and " Wonderful Grace of Jesus"
In "Generation Hymns", Tommy Walker weaves together 12 hymns, two choirs and all generations, showing that these classics are far from irrelevant for every believer. This album features songs as: "All Hail The Power of Jesus’ Name", "Crown Him With Many Crowns" and "Abide With Me"
"Living In The Wonder” is Tommy Walker’s second collaboration with award winning producer, Ed Cash. It is an album that encourages the listener to live with a sense of fear, awe and wonder before our amazing God.